Mountain Views! 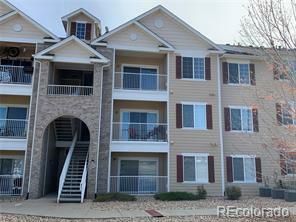 2 Bedroom 2 Bathroom condo located on the third floor with a garage! Rare opportunity to own this beautiful condo unit facing west with gorgeous mountain views and open space. Sit outside on your balcony, inside your family room or your master bedroom to enjoy Colorado's most beautiful mountains and sunsets! 1 owner with tons of builder upgrades! Master bathroom includes dual sinks and a huge oval jetted tub! Sit and relax during the winter in front of your remote controlled electric fireplace and media niche. HOA provides all exterior maintenance including snow removal and trash. Water and sewer also included with the HOA. Do not miss this opportunity to own this beautiful condo as places like this do not come along very often. $3000 in concessions also being offered so you can add your own personal touches and make this incredible condo your home.